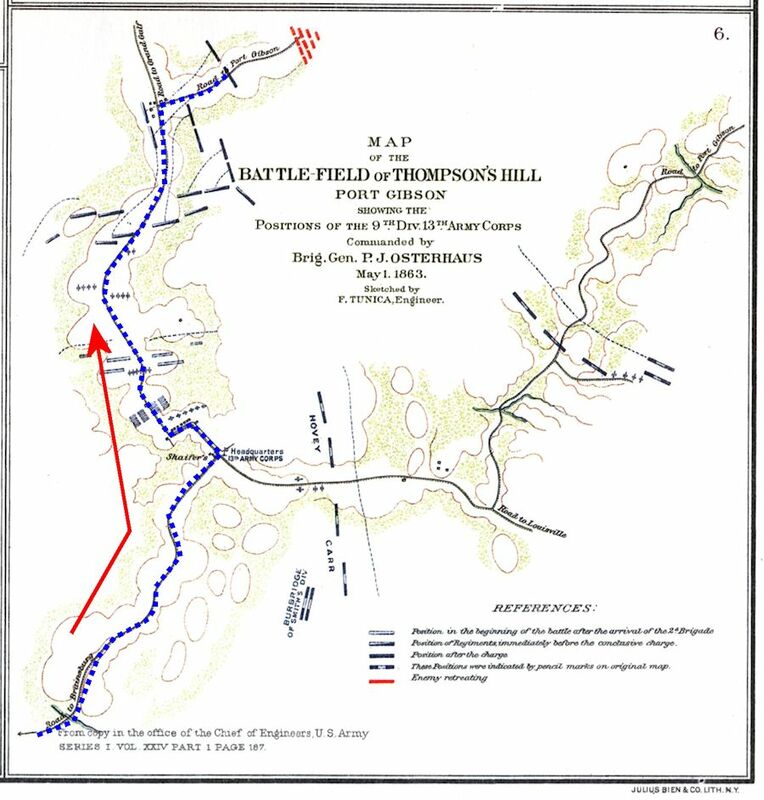 On this day the Grant's force, including the 16th Ohio, after having marched all afternoon and evening of the Previous day, east from Bruinsburg, Mississippi, very early in the morning came upon the enemy, waiting at a place called Thompson's Hill, about three miles west of the village of Port Gibson. This first battle for Vicksburg in Grant's second attempt at taking the Confederate stronghold, had begun. This time, the Union would carry the day and spell ominous times, ahead, for the Confederacy. The 16th Ohio was part of the 2nd Brigade, under Col. Daniel W. Lindsey, which included the 54th Indiana, 22nd Kentucky, 42nd Ohio and 114th Ohio. This brigade was part of Brigadier General Peter J. Osterhaus' Ninth Division which was part of the 13th Corps under Major Generals John A. McClernand and Edward Ord, all part of General Ulysses S. Grant's Army of the Tennessee. Early in the morning the battle commenced and raged with great fury for 9 hours. when we succeeded in completely routing them Capturing 7 canon, 1000 prisoners and much other war material. The rebel Genl Tracy was killed. The enemy was commanded by Gen. Bowen. To read the full version of the battle by Cpl. Theodore Wolbach, Company E, go to the Battle of Thompson's Hill page. Blue pin - Hard Times Landing, Louisiana, where the 16th Ohio, Osterhaus' 9th Division and other elements of Grants force disembarked from their boats on April 29, 1863. Yellow pin - An abandoned plantation to where the troops marched and camped the night of April 29, 1863. 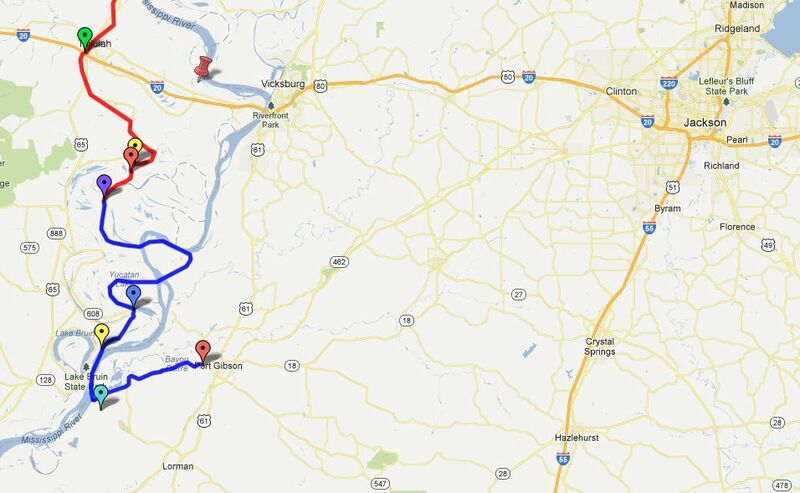 Red pin - Approximate location of Thompson's Hill, about two or three miles west of Port Gibson, Mississippi, where the Battle of Thompson's Hill occurred on May 1, 1863.